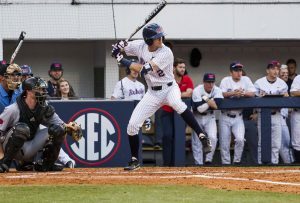 After taking 2 of 3 games against Alabama in their first SEC series this season, the Ole Miss baseball team will face the University of Arkansas at Pine Bluff in a two-game series today and Wednesday. The Rebels enter tonight’s game 14-6 on the season and have failed to rise to the occasion against premier talent thus far. Ole Miss dropped a midweek game to a solid No. 14 East Carolina squad two weeks ago and then dropped both of its games against then-No. 8 Louisville last week. The Diamond Rebs will need to get into a groove, as they begin conference play in a loaded SEC. UAPB is an abysmal 2-16 on the season, 1-8 in the Southwestern Athletic Conference. The Golden Lions come in losers of nine in a row, with their last win coming on March 1 against Prairie View A&M. They were shut out in their only game against a Power Five opponent so far this year, losing to Oklahoma 8-0. Ole Miss has continued its scorching start on the offensive end, led by senior Ryan Olenek and junior Thomas Dillard. The pair has been a lethal 4-5 combination in the Rebels’ lineup this season and looks to continue this success in SEC play. Olenek is batting .403 with 10 RBIs and a 1.008 OPS. Dillard has provided the power in the lineup, batting .333 with 7 homers and 21 RBIs in addition to posting an impressive 1.159 OPS. Sophomore Tyler Keenan has also been a solid contributor out of the three spot in the lineup, leading the team with 31 RBIs and batting .260 with 5 dingers. Pitching, on the other hand, has been a struggle for the Diamond Rebs this season. Junior ace Will Ethridge has been the brightest spot in the rotation so far, dominating opponents with a 0.46 ERA in 19.2 innings. He has registered 17 strikeouts on the season and has allowed just 1.15 baserunners per inning as well. The rest of the rotation has not been as successful and is a large part of why the Rebels have given up so many runs to subpar opponents this season. Freshman Gunnar Hoglund has been solid in most of his outings, posting a 3.26 ERA, and has allowed just 3 walks all season. Saturday starter Zack Phillips has struggled in his first season as a Rebel, posting a 4.79 ERA. He has struggled with his control, leading the team in walks allowed with 12 so far this season. Senior Connor Green and junior Austin Miller have been phenomenal out of the bullpen so far this season, each registering ERAs below 1.35 and striking out at least 15 batters. Miller leads the team in strikeouts this season with 22 in 20.2 innings of work. The Rebels will look to make quick work of the Golden Lions in their two matchups before traveling to Columbia, Missouri, to take on Missouri in their second SEC series of the season.